Awhile back, K assisted me in what I deemed to be the monumental task of canning tomatoes. After reading the amount of preserving and canning that some people do every year, I feel that I have no room to whine, but it was a lot of work. Fast forward; all of our soups are gone as are one of our chunky tomato basil sauces. I hadn't yet broken into our canned tomatoes, which were just plain tomatoes. The other night though, I decided to make spaghetti for Klark using some of the fantastic grass fed beef that we brought up from CO. In a large, deep skillet, saute garlic and onion in olive oil for a few minutes. Add beef in and brown. Open the lovely jar of homemade and canned tomato sauce. I wish I could describe to you just how amazingly delicious it is. SO amazingly delicious and aromatic. Add the tomato sauce, tomatoes and basil to the pan, along with the wine and balsamic vinegar. Toss in the mushrooms, I found that chopping them in half or quarters worked best. Simmer until sauce is thickened. If you're impatient you and your husband are really hungry, and the sauce just doesn't seem to thicken up, toss in a teaspoon of cornstarch to thicken up. Serve over pasta and top with parmesan cheese (fresh grated of course). I discovered that we didn't have enough spaghetti, so we served over penne. Yummy... and carnivore approved. I just love that we made the tomato sauce ourselves!!! 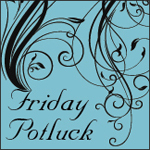 Friday Potluck #31 & Giveaway! How PF Changs Lettuce Wraps Beat Me Up!